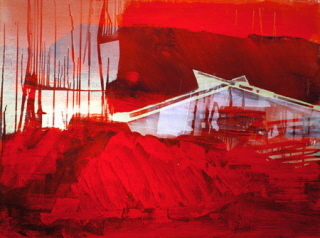 Lavadour exhibits a series of oil paintings based on landscapes and architectural under-paintings, which were layered and manipulated over the past six years. Compare and contrast black and white galore (!) from Linda Hutchins line drawings to Richard Serra's Etchings. Also Featuring Richard Diebenkorn, Brian Borrello, Richmond Burton, Greg Chann, G. Lewis Clevenger, Jerry Iverson, Marc Katano, Peter Millett, James Siena, Jeffery Simmons, Heather Larkin Timken, and Terry Winters. This show reflects a series of studies relating to the ideas of ownership and identity that focus on the artist's personal wardrobe. Using common household objects and accessible materials, her artwork explores the essence of human nature in modern society. Opening Reception: Aug 3, from 6 to 10p. Show ends Aug 31, 2006. Wanna test your anxiety levels? See how long you can stand underneath 39 (real) axes suspended from Indiana's ceiling. Opening Reception: Aug 3, from 6 to 10 p. Show ends September 3, 2006. For over 30 years distinguished Pacific Northwest sculptor Kelly, has been creating large-scale sculptures and commissioned outdoor pieces. His featured work reflects his travels to Nepal, India, Mexico and Turkey. Here + Now features four internationally recognized artists reflecting on politics from their own countries. Features Hans Haacke (Germany), Dinh Q Le (Vietnam), Kimsooja (Korea), and Ken Lum (Canada). Opening Reception: Aug 3, from 6 to 9p. Preview Reception: Aug 2, from 6 to 8 p. Show ends September 2, 2006. Leach's paintings reflect the commercial saturation of strip malls and billboards. Steel's sculptures and printed mediums investigate pop iconography in contemporary modern sculpture. In conjunction with Portland Modern. Opening Reception: Aug 3, from 6 to 9p. Show ends Aug 26, 2006. Conway addresses sexual relationships, identity, and human responses to one another. Organic, sculptural vessels. Opening Reception: Aug 3, from 4 to 7 p. Show ends September 3, 2006. Motel dedicates their entire gallery space to a 2-dimensional mind-bending installation. In hot pink and baby blue, Harris creates optical dysphoria in Motel's tiny space. The accompanying series of drawings continues her preoccupation with improvisation, minutia and subconscious patterns. Opening Reception: Aug 3, from 6:30 to 9:30p. Show ends August 20, 2006. James Lavadour pretty fantastic. It was really the only show I saw yesterday that really stuck out. I saw Mr. Double J there (and at OGLE too), but he was too busy being a socialite, so I didn't get the chance to say Hi. So "Hi" Double J.